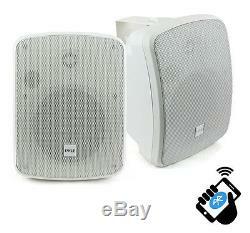 Pyle PDWR54BTW Bluetooth 600W Waterproof 5.25 Powered Outdoor Speakers (Pair). The Pyle PDWR54 mountable speaker systems provide high-powered wireless Bluetooth performance -- indoors or out! Featuring rugged marine grade waterproof construction, they are the perfect choice for adding full range stereo sound on boats, decks, patios or backyards. The system includes (2) speakers; one active and one passive, along with a built-in 2-channel digital amplifier. Once connected, the polymer dome tweeters create crisp high frequency sound and the fortified long-throw woofers generate some impressive bass. Built-in Bluetooth audio streaming ability allows you to connect and stream audio from all of your favorite devices, quickly and easily works with iPhones, Androids, Smartphones, Tablets, Laptops, Computers, etc. You will also have the ability to connect additional external devices to your speaker system thanks to the rear located gold-plated speaker plug terminals and RCA audio jacks. 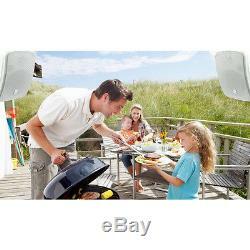 Add instant wireless streaming ability and high-powered waterproof audio performance with the Pyle PDWR54 indoor/outdoor speaker systems. We are an authorized Pyle Dealer! 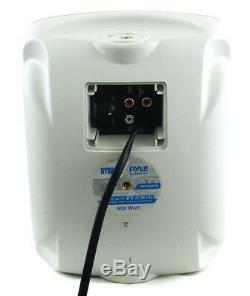 2 Pyle PDWR54BTW Bluetooth Powered Outdoor Speakers. 600 Watt Rated Peak Power. 300 Watt Rates RMS Power. 5.25' Long Throw Woofers. 1.0'' Polymer Dome Tweeters. Cone Material: PP Mica + Rubber Surround. Dimensions (L x W x H): 5.75'' x 7.09 x 9.88'. Active & Passive Speaker System. 2-Way Full Range Stereo Sound. Custom Tooled Design for High Power and Deep Bass Response. Removable & Rust Proof Aluminum Speaker Grills. Gold Plated Speaker Plug Terminals. RCA (L/R) Audio Input Connector Jacks. Single RCA Speaker Output Connector Jack. Spring Loaded Mounting Bracket Included. Heavy Duty Engineered Plastic Cabinet. Ability to Daisy-Chain Active Speaker to Passive Speaker as Stereo System. Excellent for Monitor or Surround Sound Applications. Great by the Pool, on the Patio or in the Boat. For Indoor / Outdoor Use. Instantly Stream Music from Your Connected Device. Works with All of Your Favorite Devices. IPhone, Android, Smartphone, iPad, Tablet, PC, etc. Bluetooth Version: Bluetooth 3.0. Bluetooth Network Name: Pyle Audio. Bluetooth Wireless Range: 30'+ Feet. Our Pyle Home line includes a wealth of products and accessories designed to enrich your media experiences in the home and on the go. Start with your home theater, a stalwart of any modern house. Weve got projectors, TVs, mounts, and stands, just to get started all fully equipped with state-of-the-art HD technology, compatible with beautiful video game consoles like Xbox 360, PlayStation 3, and Wii, as well as your favorite Blu-Ray players, for crisp, hi-res images that explode in your eye on a mind-blowing scale. Of course, Pyle Home also carries all the cables and adaptors you need for a fully operational setup thats sure to be the envy of your neighbors. Theres plenty more to keep you entertained. Bass-expanding mini speakers that run on rechargeable batteries and play your digital music, wherever you go. Perfect for the dorm room or sitting by the pool. Vintage turntables get the look of yesterdays classic phonographs with todays high-quality manufacturing standards. 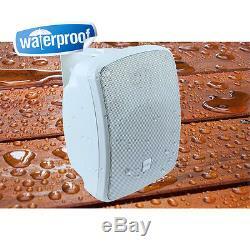 Power amplifiers, horn speakers, and waterproof speakers for your garden. We have it all at Pyle Home. Cancelling Your Order: Your order is important to us and will be processed immediately. Select the reason for the return. The item "Pyle PDWR54BTW Bluetooth 600W Waterproof 5.25 Powered Outdoor Speakers (Pair)" is in sale since Friday, January 29, 2016. 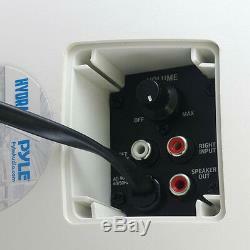 This item is in the category "Consumer Electronics\TV, Video & Home Audio\Home Audio\Home Speakers & Subwoofers". The seller is "vm-express" and is located in Lincoln, Nebraska.